There is a prairie saying about zucchini that I remember going something like this - "Not to have zucchini, is not having friends". This means that zucchini is basically easy to grow, and usually produces many fruit (yes, botanically zucchini is a fruit, but we all treat it like a vegetable), which in turn results in gardeners always giving away their abundant yield to family, friends and neighbors. Zucchini is a squash and can be steamed, boiled, grilled, stuffed and baked, barbecued, fried and shredded. I find it really does not have much of a taste so I like it in recipes where there is an abundance of other flavors or seasoning; as well, incorporating it into baked goods helps to keep them moist. My best ways to use zucchini - Zucchini Veggie Medley, Zucchini Pan Bread, Zucchini Chocolate Chip Cake, and it is always good to add to homemade vegetable soup. 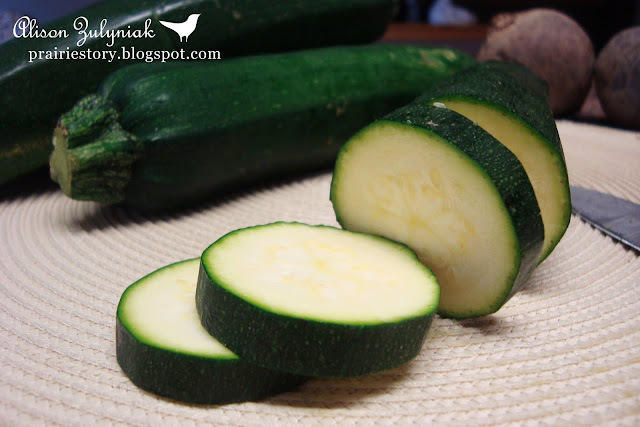 What is your favorite zucchini recipe?